This weekend saw possibly the most crucial weekend in English football, with big games in the Premier League and the final games in the Npower Football League. In the LV=CC there was 4 fascinating games in division 1 but most games were expected to be wet for all 4 days. At The PROBIZ County Ground (Hove) Sussex won the toss and elected to field. The sharks got off to a dream start dismissing Porterfield on 8 and Bell for a duck, the Bears were now 13-2. However, the Bears fight back was just around the corner. A fantastic partnership of 219 between Chopra and Trott saw the bears get back on their feet before losing their 3rd wicket on 232; Chopra for 105 showing why he is a top class batsman. Warwickshire lost 2 more wickets before the close on day 1 where the game was balanced with the bears on 281-5 with thanks to Trott and his 132 not out. On day 2 the bears continued where they left off batting fantastically. A 110 partnership between Ambrose and Trott saw the Bears reach 394 before Trott fell on 178. Sussex were left destroyed as Ambrose made 75 and Clarke made 78 to see the Bears reach a astonishing 545 all out. In reply Sussex got off to a blinder making 39 before losing the 1st wicket. However, another wicket left Sussex struggling at the close on 57-2 trailing by 488 runs. Horrible 3rd days on the south coast but the visitors were able to take 3 more wickets before the rain set in leaving them on 80-5 at the end of day 3. A draw was now most likely. This was confirmed on day 4 as the day was washed out before a ball was balled. The league leaders remain top picking up 7 points, but Sussex are 6th with thanks to the points they some how picked up in the game. another casualty of the heavy rain across the country, but Worcestershire managed to get a draw. At Taunton, Somerset had to endure 108.3 over’s in the field until they could bat as Lancashire hit 400 all out. 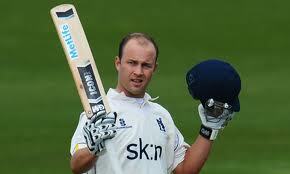 Croft made a stunning 113 alongside Prince who fell just short of a century with 96. Philander managed to take 5 wickets for Somerset as he prepares for South Africa’s summer tour of England. When Somerset got in to bat they managed to get 87 runs for 3 wickets before the game was over due to rain. Another game which couldn’t get any play on day 4, a third draw in Division 1. Surrey and Durham had to sit and watch and experienced 4 days of rain at the Oval. Not the best way to pick up points. Warwickshire remain top of the LV=CC Division 1 with 50 points, 2 points clear of Nottinghamshire with a game in hand, all looking good so far for the bears. Durham are bottom with just 13 points and yet to win a game.